Macy's One Day Sale is Back! Macy's After Christmas Sale is Here! It’s Macy’s Lowest Prices of the Season Sale! 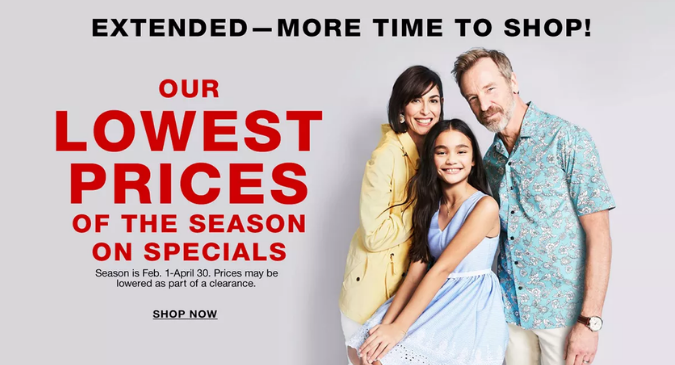 Now through April 9, you’ll score the lowest prices of the season at Macy’s. Not just that, but you can still save an extra 20% off when you use the promo code SAVE. Shop all the limited-time specials from the Macy’s Lowest Price of the Season Sale here. You’ll save over 50% off regular prices on everything from mattresses and luggage to shoes and accessories. Just don’t spend too much time reading because you only have a few days to take advantage of the incredible deals!